The online EdBlocks programming environment is simple to use on both computers and tablets. EdBlocks contains more than 150 blocks, making it easy to experiment with programming. All the blocks are accessible through the main menu, organised into five different categories. Simply open one of the menus by clicking on it in the app, then select the block you want. Drag and drop each block to the ‘start’ block in the main programming area to add it to your program. It’s that easy! These free, downloadable resources can help you get the most out of EdBlocks. 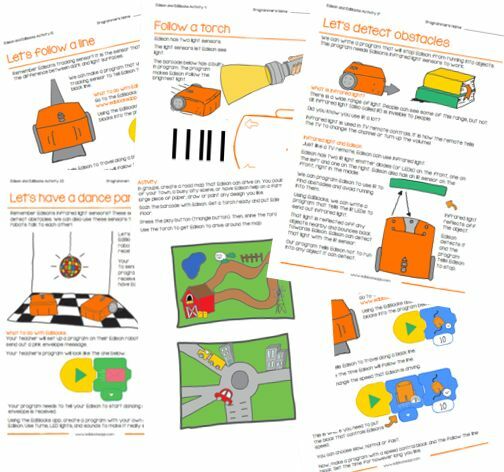 The EdBlocks activity worksheets are designed to allow students to work through activities independently, gradually learning about both the Edison robot and EdBlocks. This set of 23 lesson activities is perfect for students in year levels 3 to 6. 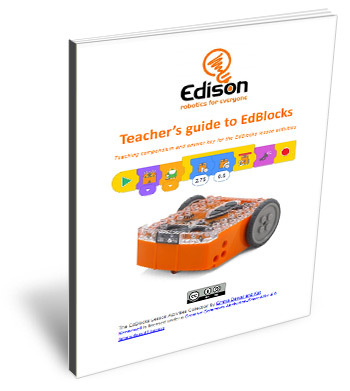 This guide offers teachers and instructors overviews, activity extensions and other supporting information for the EdBlocks lesson activities to help make teaching EdBlocks easy and fun. Each EdBlocks activity is included in this guide along with any relevant supporting information for that activity. This resource serves as a guide as to how the EdBlocks lesson activities to link to standards and requirements in the Australian Curriculum (v8.3). Need an offline reference to the blocks in EdBlocks? This guide includes images of the blocks in EdBlocks and the tooltip helper text for each block from the online application. 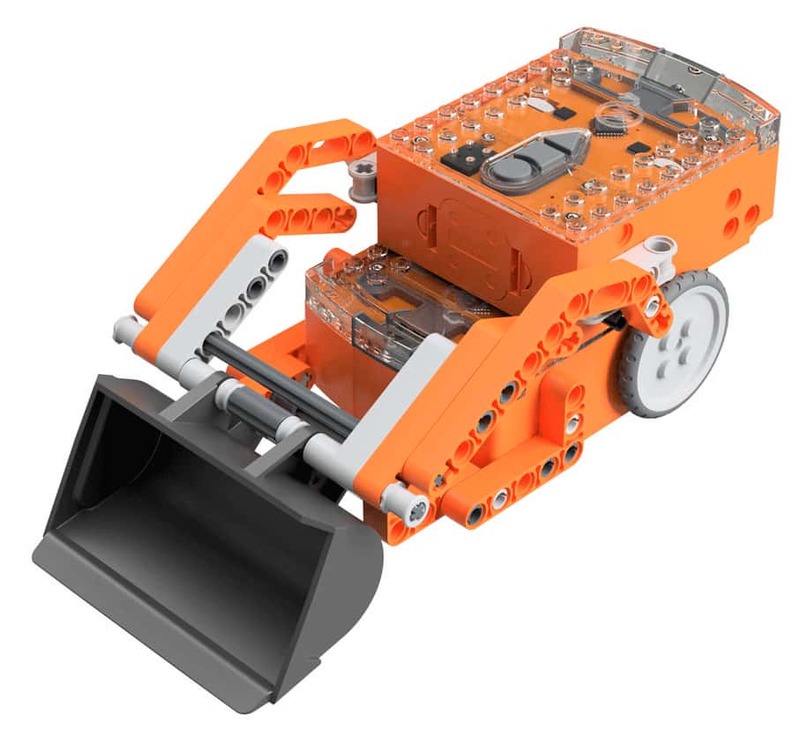 Give your students the opportunities to program solutions to real-world robotic challenges using EdBlocks and EdCreate, the Edison robot creator’s kit. 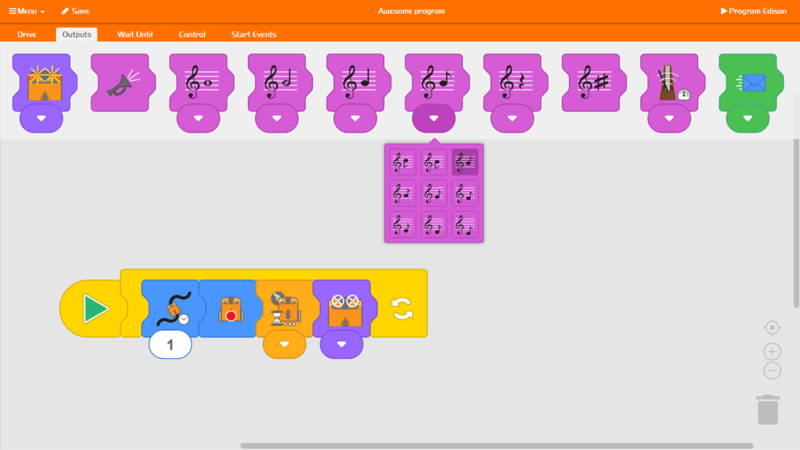 Multiple programming challenges perfect for EdBlocks using the EdCreate EdBuilds are available in the EdCreate teaching guide. Or unlock your student’s creativity and EdBlocks programming prowess with the EdCreate EdChallenges! How do I access EdBlocks? How do I run an EdBlocks program on Edison? If the first block in your program is a ‘wait until’ block, Edison will pause at that block until the wait until condition is met. If you are using a start event, when the play (triangle) button on Edison is pushed, Edison will run the main program. If the condition of the start event occurs, Edison will run the start event sub-program to completion, then return to the main program and continue the main program. This will happen whenever the conditions of the start event are met. If no blocks are attached to the main program, Edison will wait until the condition of the start event is met, then run the start event sub-program. Each block in EdBlocks has a tooltip with helper text. Hover your pointer over a block to see what it does. You can also see the full list of blocks here. Where do I find more blocks? EdBlocks contains more than 150 different blocks organised into five different menus: drive, outputs, wait until, control or start events. Open one of the menus by clicking on it in the app, then scroll left and right to see the items in that menu. Related blocks are grouped together inside each menu. Click on the arrow below a block to see the other blocks in that group. What are the numbers under some of the blocks? Blocks with a number under them allow for user input to control the block’s duration. The blocks that have a little clock-face symbol allow users to input a time. You can change the time by clicking on the number and typing in your desired time, anything from 0.01 to 320. Time is in seconds. Blocks with a number underneath but no clock-face symbol allow users to input the number of repetitions the block will perform. You can change the number by clicking on it and typing in your desired number of repetitions, anything from 0 to 320. Repetitions must be in whole numbers. How do I save my EdBlocks programs? To save your programs in EdBlocks, you need to have an account and be logged in. You can create an account by clicking on the menu button in the upper left-hand corner of the app. Select the ‘Register’ option and follow the steps to register your free account. Blocks can be deleted by dragging them to the bin in the lower right-hand corner of the EdBlocks app or by right clicking the block with your mouse and choosing the ‘delete block’ option. Blocks can be copied by right clicking the block with your mouse and choosing the ‘duplicate’ option. You can also copy a block by clicking on it in the workspace and using keyboard shortcut Ctrl+C, then Ctrl+V. You can update your account details by clicking on the menu button in the upper left-hand corner of the app and selecting ‘Settings’ from the menu. How do I use the start events? The ‘start events’ blocks allow a user to make a sub-program begin from a specific event while the main program is running. Perhaps the most advanced set of blocks in EdBlocks, these blocks emulate the coding idea of ‘interrupts.’ Start events allow users to vertically layer programs, with secondary programs interrupting the main program when the start event is triggered. To use a start event, simply add it to the working space in the EdBlocks app and drag and drop program blocks after it, as you would the normal start block. The main start block cannot be removed, because that is the beginning of the main program. When you download your program to Edison, both the main program and the sub-program beginning with the new start event will download. When the play (triangle) button on Edison is pushed, Edison will run the main program. If the condition of the start event occurs, Edison will run the start event sub-program to completion, then return to the main program and continue the main program. This will happen whenever the conditions of the start event are met. If no blocks are attached to the main program, Edison will wait until the condition of the start event is met, then run the start event sub-program. How do I use the coloured envelopes? Edison robots can send and receive infrared messages to one another. In EdBlocks, the coloured envelopes are the blocks used for this messaging function. To use the messages, you will need at least two Edison robots. You will need to write a separate program for each robot. One robot will need to send one of the coloured messages out as a part of its program. The second robot will need to have a program that contains either a ‘wait until’ or ‘start event’ message block of the same colour. When the first robot’s program progress to the ‘send message’ block, it will send out an infrared message. This will trigger the second robot to begin or continue its program from the message block in the second robot’s program. See activity 23 in the EdBlock lesson plans for an example activity using messages. How do I use remote controls with EdBlocks? To use a remote control with an Edison robot in Edblocks, select one of the remote control start event blocks. Use that block to create a sub-program and download it to Edison. Before you run the program, you will also need to scan the corresponding ‘TV/DVD remote control barcodes – programmable commands’. You can find the full list of the barcodes and further details about using these barcodes on the barcodes page. Once you have scanned the correct barcode and downloaded the program, you can run it like a standard start event sub program. What kind of language is EdBlocks? A drag-and-drop block-based system, EdBlocks has been developed using the Scratch Blocks code base developed by the MIT Media Lab from the Blockly code base developed by Google. What age user is EdBlocks for? The fun, colourful, intuitive design of EdBlocks makes it a great tool for introducing coding to anyone no matter their age. EdBlocks was created specifically for younger users and is ideal for students aged 7-12 years old. Free, downloadable lessons targeted to students in grade levels 3-6 are also available. What do the different blocks in EdBlocks do? EdBlocks contains more than 150 different blocks. In the app, each block has tooltip helper text. Hover over a block to access the tooltip. You can also see the full list of blocks here. All of the blocks are grouped by type and then organised into one of five different categories: drive, outputs, wait until, control or start events. The drive blocks allow a user to control how Edison moves. The basic four blocks in this section allow users to select the direction and determine the duration of Edison’s ‘drive’ abilities by changing the time input. Other drive blocks utilise Edison’s built-in sensors to control the drive behaviours. Users can also use drive blocks to control Edison’s speed and pause the drive motors. The output category contains the different non-drive outputs Edison can create. There are three main groups in this category: lights, sound, and outbound messages. Lights include turning Edison’s lights on or off, individually or together. Sounds include a simple beep, a range of musical notes and the ability to control the pace at which the notes are played. Outbound messages allow an Edison to send one of six infrared messages out to other Edison robots. All of the ‘wait until’ blocks tell Edison to wait for something to happen before continuing on with the program. These blocks allow users to create longer and more complex programs. Many of the ‘wait until’ blocks utilise Edison’s sensors while others allow for external inputs to change the program, such as having one of the robot’s buttons pushed or hearing a loud clap. Another group of ‘wait until’ blocks instructs the Edison to wait until it receives one of the six infrared messages before continuing with its program. This category contains blocks which allow additional controls, such as loops, to be added to a program. These blocks offer additional ways to create more complex programs. Loops, which make up the majority of the control blocks, enable Edison to repeat elements of a program infinitely, a set number of times or until something happens, such as a button is pressed. The ‘start events’ blocks allow a user to make a sub-program begin from a specific event while the main program is running. Perhaps the most advanced set of blocks in EdBlocks, these blocks emulate the coding idea of ‘interrupts.’ Start events let users tap into even more of Edison’s abilities, including being controlled by remote controls. Start events also allow users to vertically layer programs, with secondary programs interrupting the main program when the start event is triggered. Which browsers are compatible with EdBlocks? EdBlocks is compatible with Chrome, Safari, Microsoft Edge and Firefox. Is there an EdBlocks iOS/Android app? You can use EdBlocks through the online app at https://www.edblocksapp.com/ with devices running either iOS or Android. Dedicated iOS and Android apps for EdBlocks are being considered but are not currently in development. Please be sure to sign up to our newsletter to be informed about future app releases. Is there an offline version of EdBlocks? Why isn’t Edison playing music? If you have a V1 Edison, you will need to update your Edison’s firmware to be able to make your Edison compatible with the music components in EdBlocks. Please follow the steps on our firmware update page to make sure your Edison is updated. Be sure that the EdComm cable is plugged in fully and the volume on your device is all the way up. If the EdComm cable is not plugged in fully, you will hear a sound like an old dial-up modem when you press the ‘program Edison’ button on the pop-up window. Sound enhancements can also sometimes cause the Edison program to not download correctly, resulting in the fail sound. For more help on sound enhancements, please visit our troubleshooting guide. When many users in a single location, like in a classroom, are downloading programs at the same time, you may experience slower internet speeds. This can cause the program to take longer to generate the ‘program Edison’ pop-up box and for the program to download to Edison. With a very slow connection, you may need to try again. Press the stop (square) button on Edison, then press the record (round) button one time. Restart the download by clicking on the ‘program Edison’ button in the top-right corner of the app. The EdBlocks Lesson Activities Collection by Emma Dewar and Kat Kennewell is licensed under a Creative Commons Attribution-ShareAlike 4.0 International License. Looking to translate the EdBlocks resources into another language? Download the translation kit to get the editable files you will need.